We compare your present location for up to 400 US markets for payroll and operating costs, and then rank the results. 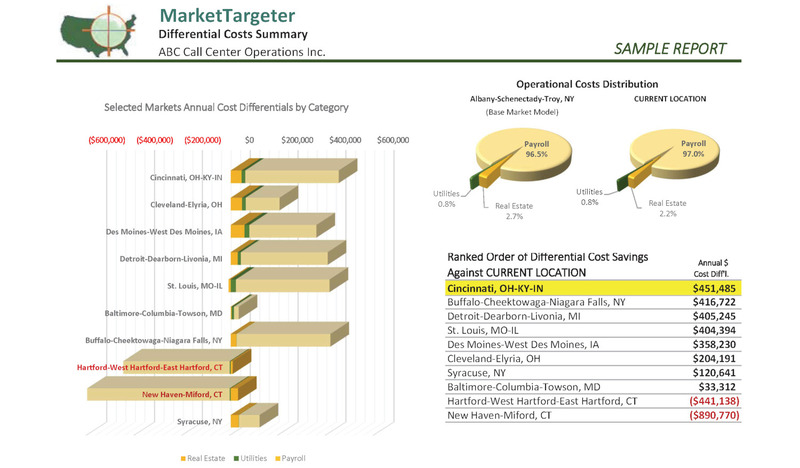 Identify your market area and compare your current operational costs against the market average to see if you are saving or overpaying. Compare your present location to as many as 400 major US markets using your current operation as the base. Determine if your present location is optimum for your needs or if a move or expansion to another market area would be a potential windfall. For any industry, based on your information about the types of jobs in your company, the real estate you occupy, and the utilities you use for business, we will quickly generate a model that will be used to generate cost differentials. We will confirm everything with you in advance of running the scenario, and then alert you by email when the results are ready for download. Delivery to you is within 48 hours for the basic plan, but larger market selections may take a little longer. "This is a vast marketplace, with great variability of costs and opportunities, and if more companies would simply look inward rather than offshoring they would recognize America's innate capability to compete globally." Take a look at our free MarketTargeter demonstration report to see for yourself. We think you will be amazed at the range of operational savings available by just selecting the right market. Moving or expanding may not be in your immediate plans, but a MarketTargeter analysis might be right what you need to help with a future decision. Once you have had the opportunity to review the demonstration report, please contact us to receive a price quotation for a MarketTargeter report for your company's use.